The taxi market in cities around the world is ripe for disruption, and startups like Uber in the US are grabbing headlines as they offer new, hi-tech ways to order a ride. London is one city where competition and innovation is rife as tech companies vie to transform the industry. We recently covered Hailo, one company offering a new way to order black cabs – the cars Londoners can flag down in the street. However, the private hire minicab market, where customers book their journeys in advance, isn’t standing still either. Kabbee is a startup which aims to make it easy to find the lowest-price, soonest private hire trip to their destination. Offered on the Web, and as iPhone and Android apps, Kabbee is essentially a dynamic price comparison service for London minicabs. You enter your name; how many people will be traveling; the time, start and endpoint of the journey, and whether you require child seats or space for suitcases. The app then searches the many private hire firms (with in excess of 3000 cars in total) that are signed up to the service to give you a list of quotes to choose from. Payment can be made by adding money to your pre-paid Kabbee account, or by credit card on a per journey basis. You can also opt to pay cash when you make your journey. 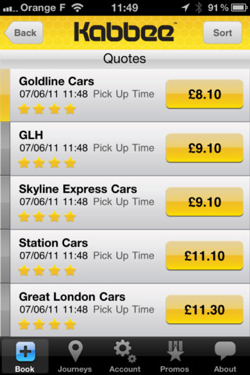 The benefit for users here is clear – aggregating the prices from a wide range of operators across London into one app increases convenience and also potentially encourages greater competition between minicab firms, who may not want to miss out on journeys by offering a higher price than their rivals. Kabbee selects minicab firms to participate in its service following an accreditation process designed to make sure that only good quality firms are involved. It’s easy to see why operators would want to be involved – it provides access to a wider marketplace than they may normally be able to reach via traditional advertising methods. Kabbee says it’s handling one quote per minute, 24 hours a day, seven days a week, so there’s clearly demand for the service. Perhaps the closest competition to Kabbee comes from Ubicabs. Both services are at home in mobile app form, with the desktop browser user experience not feeling quite as polished. 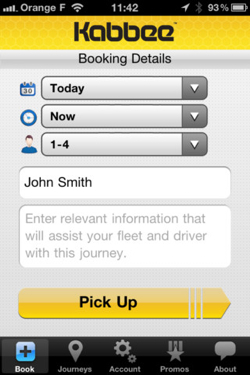 Ubicabs has some nice features such as a ‘get me home’ option, which allows you to book a minicab home from your current location with minimal fuss. It also automatically books the cheapest option, which may or may not be a good thing depending on your viewpoint – Kabbee lets you choose which cab firm picks you up and strike your own balance between pickup time and price. Kabbee’s other strengths include the ability to pay for your journey ahead of time directly from the app, a greater number of cars (in excess of 3000 compared to Ubicab’s 1500-2000) and coverage of the whole Greater London area. However, Ubicab tells us that it’s in open beta, is expanding its coverage and will be officially launching in a couple of months’ time. Kabbee was founded by a team with experience in financial markets and the taxi industry. Backed by angel funding, ten developer-years went into the technology behind the service, only some of which the startup says is used in its current form. For the future, Kabbee plans to expand to offer a greater choice of vehicles – from executive cars, to an environmentally -friendly option, to limousines, and even more ‘novelty’ options. Black cabs will be offered in 2012. On the technical side, the startup wants to offer real-time information to users about journeys they’ve booked. Expansion beyond London is also planned to more UK cities, and even abroad. While there will doubtless be even greater competition in this ‘Minicabs 2.0’ market in 2012, as players from abroad such as Germany’s MyTaxi expand, this can only be good for consumers, and Kabbee is definitely a player worth keeping an eye on.